Confused at Night in Singapore, Going to Here ! New Zealand consists of two large islands, North and South Island, plus several other smaller islands. Stewart Island is the largest from several small islands, so it is sometimes Stewart Island referred to as the third island. North and South Island, separated by Cook Strait with 32 kilometers wide. In the north and east there is Pacific Ocean, while in between New Zealand and Australia are the Tasman Sea. The total area of ​​New Zealand is approximately 270 535 sq. km. South Island slightly wider than the North Island. North Island has several active volcanoes while the South Island has mountains with snow-capped peaks and glaciers. Mountainous transverse row of nearly 500 miles along the plain known as the Southern Alps. Waikato River is the longest river in the North Island, while there is also the largest lake in the North Island, the Lake Taupo area of ​​607 sq. km. The highest point in the country is located in Mouth Cook, South Island and more than 75% of the parts are in New Zealand more than 200 meters above sea level. Land in New Zealand split of 50% grassland, 30% forest and 15% agricultural land and plantations. In the North Island, sheep and other animals were found in Hamilton and New Plymouth. While in the South Island, local farms and ranches scattered around Invercargill and Dunedin. New Zealand has a diversity of ethnic groups, with 70% of the population were from Europe. 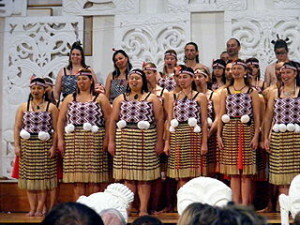 Approximately 15% of the population is Maori, Polynesian 3%, and the rest from various other ethnicities such as African, Chinese, Dutch, and the Indians who had been long settled in New Zealand. Auckland is New Zealand’s largest city, with a population of about 1.5 million people. Christchurch and Wellington is the largest city after Auckland, with a population of about 360000 people. Christchurch is the largest city in the South Island. However, since the incidence of earthquake early 2011, most of the Christchurch city looks like a ghost town. Statistics show that the total population in New Zealand approximately 4.4 million people. Surveys show that most populations are at Auckland caused by moving population from the South Island to the North Island, is also supported by a factor of immigrants from outside New Zealand. The official language used in New Zealand are English and Maori language were established since 1987. Maori language is only used in New Zealand alone, not in other countries in the world. While it was unveiled, but the Maori language is struggling against extinction. In the treaty of Waitangi in 1840, Queen Victoria promised to Maori tribe for this Maori language will be protected. However, only recently gained the support of the Maori language is strong enough to be conserved. Now the Maori language commonly used in the media and schools. When the Maori moved to the big city in 1940, they pressured and forced to speak English. Children raised without being taught the Maori language. In 1970 the Maori language is almost extinct. But the latest government survey shows New Zealand there are currently about 130,000 people who can speak Maori language.